Homayun’s artistry demonstrates how an imaginative musician working within a traditional musical idiom can enrich and expand its expressive power. 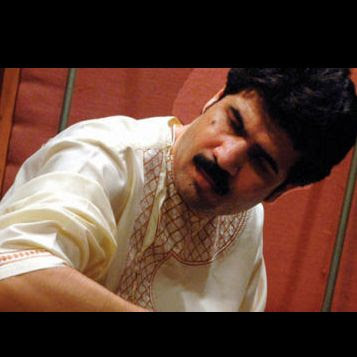 Homayun Sakhi is the outstanding Afghan rubâb player of his generation, a brilliant virtuoso endowed with a charismatic musical presence and personality. During Afghanistan’s long years of armed conflict, when music was heavily controlled, censored, repressed, and, finally, totally banned, the classical rubâb style to which Homayun has devoted his career not only survived but reached new creative heights. Homayun’s artistry demonstrates how an imaginative musician working within a traditional musical idiom can enrich and expand its expressive power while respecting the taste and sensibility passed down from master musicians of the past. Moreover, Homayun’s personal story illustrates the extraordinarily challenging conditions under which he and his fellow Afghan musicians have pursued their art. The art music tradition of the Afghan rubâb featured on these recordings is very much a hybrid creation. Indeed, Afghan music represents a confluence of cultural influences whose sources lie to the east, north, and west of present-day Afghanistan, in the great historical empires of Persia, Central Asia, and India. Each region has contributed instruments, genres, and performance styles to Afghanistan’s diverse musical landscape. The rubâb itself is of Central Asian origin - one of a family of double-chambered lutes that includes, among others, the Iranian târ, Tibetan danyen, and Pamir rubâb. While rooted in the raga tradition of North India, the cultivated art music performed on the Afghan rubâb also has strong stylistic links to Iran. The tabla, the pair of drums that accompany the rubâb and express the music’s sophisticated rhythmic element, is indisputably Indian, but its creators seem to have drawn inspiration from older forms of Central and West Asian kettle and goblet drums. Finally, Homayun’s performance style has been shaped not only by the musical traditions to which Afghan music is geographically and historically linked, but by his lively interest in contemporary music from around the world. Homayun Sakhi was born in Kabul in 1976 into one of Afghanistan’s leading musical families. From the age of ten, he studied rubâb with his father, Ghulam Sakhi, in the traditional form of apprenticeship known as ustâd-shâgird (Persian: “masterapprentice”). particular rhyme scheme. Ghazals provided the texts for the new style of Afghan vocal music, while the music itself was based on the melodic modes (raga) and metrical cycles (tala) of Indian music. The Kabuli style of ghazal singing later spread to other Afghan cities. Musicians in Kabul also cultivated the art of playing the rubâb, which was prominent in regional folk music. Today the rubâb is regarded with great pride by the people of Afghanistan as their national instrument. The unofficial headquarters of Afghanistan’s émigré music community in Peshawar was Khalil House, a modern apartment building where between thirty and forty bands established offices. The building’s apartments - each one essentially a single large room - became the headquarters of a group of musicians to which potential clients came to arrange for the musicians’ participation in wedding parties and other musical events. For several years, Khalil House was a hotbed of musical activity for Afghan musicians in exile. Some musicians ran their own music schools, and informal jam sessions where young musicians competed to show off their virtuosity and technical skills were common. Long hours and a spirit of camaraderie in Khalil House enabled the musicians from Kabul to maintain and further develop key musical skills.